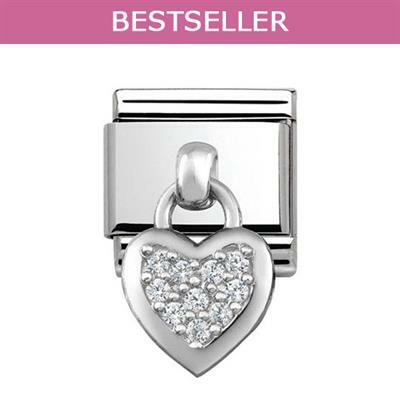 This beautiful Silver Hanging Heart Charm with CZ Embellishment is a fabulous new addition to the popular stainless steel composable collection, and features a sterling silver hanging motif. This classic charm with a hanging heart design is a sweet addition to Nomination's new Christmas collection. This makes for a perfect romantic gift, and will add a touch of festive sparkle to any Nomination collection. Will fit any classic sized Nomination bracelet.